Here is Connection & Working Code for ESP32 Arduino with DHT11 Sensor. We will use Adafruit’s libraries for DHT11 and DH22 Temperature Humidity Modules. For using DHT11, DHT21, DHT22 with non-ESP32 Arduino please read our previous guide on Arduino Temperature Humidity Sensor. For ESP32, it is mandatory to have the common required setup for Arduino IDE (ESP32 does not work with Arduino IDE out of the box). We have attached the data pin to pin 15 of ESP32. You will get the required Fritzing diagram and Arduino code on our Github repo. The code definitely works as we have tested it. This Article Has Been Shared 6690 Times! 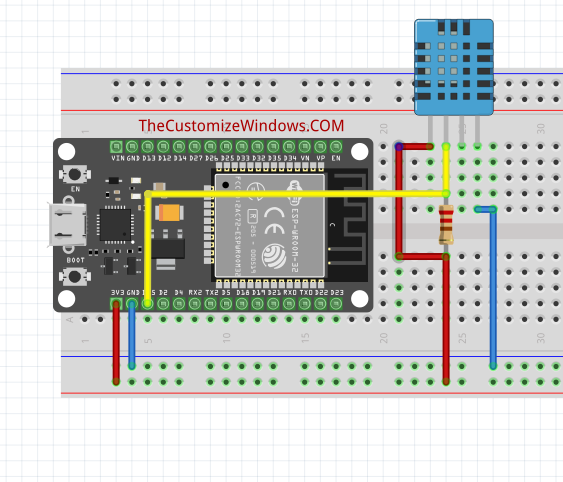 Cite this article as: Abhishek Ghosh, "ESP32 Arduino with DHT11 Sensor : Connection & Code," in The Customize Windows, March 17, 2019, April 18, 2019, https://thecustomizewindows.com/2019/03/esp32-arduino-with-dht11-sensor-connection-code/.